The decision behind closed doors leaves tens of thousands without health coverage. Francisco Kjolseth | Tribune file photo Representing the tens of thousands of low-income Utahns in need of help, Stacy Stanford, left, is joined by Kylie Toponce who has already filed for bankruptcy at 24 years old and might have Crohn's disease and Dan Davidson, who's in long term recovery. 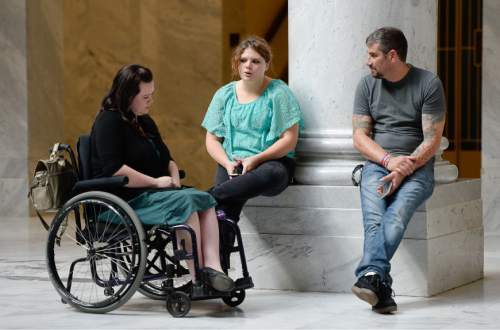 The three gathered at the Utah Capitol on Tuesday, Oct. 13, 2015, anxiously awaiting news as the House Republican Caucus went into a closed-door session to take a straw vote on the latest Medicaid-expansion plan, Utah Access Plus. The House GOP soundly rejected the plan. The latest attempt to help low-income Utahns get health insurance was dead on arrival Tuesday, as House Republicans dealt the proposal a crushing blow, sending state leaders back to the drawing board and leaving tens of thousands of people without hope for health care for the foreseeable future. Utah Access Plus, the latest plan aimed at expanding health-insurance coverage to an estimated 125,000 Utahns, received seven votes from the 63 GOP House Republicans in the three-hour closed-door meeting, House Speaker Greg Hughes, R-Draper, said Tuesday night. Hughes said it was concerns about the long-term sustainability of the Medicaid funding for the program, the potential for exploding costs and vocal opposition from medical providers who were called on to pay for part of the program that ultimately doomed Utah Access Plus in the House. "Everyone loves expanding Medicaid until they have to pay for it," Hughes said, although he said the search for a way to cover the poorest Utahns and those deemed medically frail will continue. "I do believe the State of Utah and it&apos;s Legislature has the political will to provide health care to those who need it." The plan also fell well-short of the 15 votes needed to pass the bill in the Senate, even with Democratic votes counted, Senate President Wayne Niederhauser, R-Sandy, said. "There was enough of a margin that it would have been really hard to get there with Utah Access Plus," Niederhauser said. The move dashed Gov. Gary Herbert&apos;s hope of calling a special legislative session later this month to pass a proposal, and leaves the future of Medicaid expansion  a cornerstone of the Affordable Care Act, commonly known as Obamacare  uncertain. Herbert&apos;s spokeswoman, Aimee Edwards, said the governor continues to believe that his Healthy Utah proposal, which was defeated by the House during the previous legislative session, is still the best option on the table. "The poorest among us will continue to struggle until Utah leaders can find agreement on this difficult issue," she said. "Unfortunately, the House of Representatives defeated Healthy Utah and continues to push back against other proposals, even those crafted by their own legislative leadership." Hughes and House Majority Leader Jim Dunnigan, R-Taylorsville, said they voted for the plan. It is unclear which other five House members voted to support the measure, or who any of the Senate backers were, since both votes were held in secret. Niederhauser said leaders plan to meet Wednesday to decide what the next step might be. Utah Access Plus was the product of months of negotiations between Herbert and legislative leaders. The proposal was to have doctors, hospitals, pharmaceutical companies and others pay about $50 million in new taxes. The money would have been matched with about $450 million in federal money and used to buy health care for about 90,000 Utahns making less than 138 percent of the poverty level  about $30,000 for a family of four. The state would have paid another $25 million to cover an additional 30,000 who are now eligible for traditional Medicaid coverage, but have not signed up for the program. But health care providers roundly panned the plan, objecting to having to pay for the program, and lobbied hard against the proposal. And Republican lawmakers balked at levying the slew of new taxes that would be needed to implement the new coverage. The defeat left those who might have received coverage wondering what might be next. Kylie Toponce, a 24-year-old student who works full time but doesn&apos;t have health benefits, has been trying to get a diagnosis for the gastrointestinal pain that has plagued her for six years and forced her into bankruptcy because she couldn&apos;t afford the medical bills. "I would kill for a diagnosis at this point. Even if I had colon cancer, I&apos;d be, &apos;OK, now we know what it is,&apos; " she said. Toponce said the issue comes down to lawmakers caring more for money than people, but she believes the Legislature will have to budge on Medicaid expansion. "I feel like people are sick and people are dying and people are upset and the only reason it&apos;s happening is because people are poor, and that&apos;s sad," she said. House Majority Whip Francis Gibson, R-Mapleton, said he voted against the health care expansion because the existing Medicaid program, which covers children and the disabled, is underfunded, while most of those who would be covered under the expanded program  all but about 30,000 of the 125,000 who would be insured  already have health insurance. "For me, why do I want to fund that when I can&apos;t even properly fund the children and disabled who are truly in need of the help?" he said. Niederhauser said the months of work leaders put into crafting the plan were valuable, despite the failure to pass a bill. "I am so much more prepared to deal with this in the future, having gone through all the different options that we have," Niederhauser said. "One of the big things that was missing from our discussion last year is, how are we going to fund it and is the program sustainable? … I&apos;m much more educated on the budgetary issues, so I applaud the effort that was put forth."